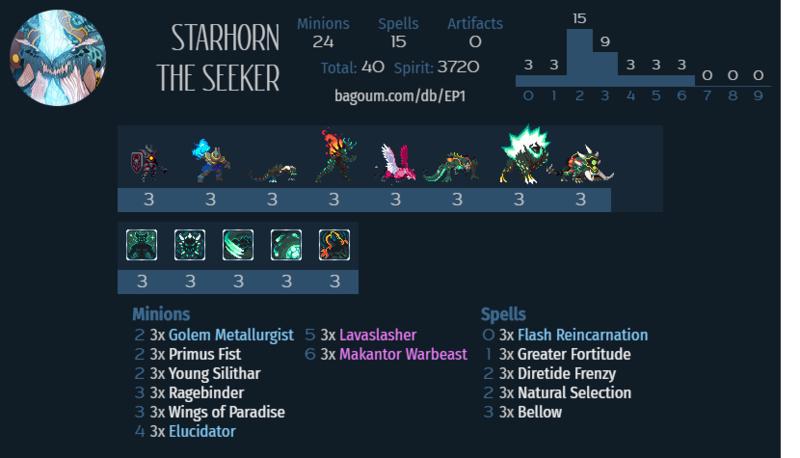 This is a variation on AlphaCentury’s and IceyFire95’s old Flyhorn decks. If you want to play Magmar, but don’t want everyone to hate you for playing Ragnora or running Decispikes, this deck is for you! It’s straightforward and aggressive, aiming to play powerful minions on curve, gain tempo advantage with timely frenzy attacks, and win via buffed rush minions. Most of your spells are buffs. Your primary gameplan against most decks is to catch them off-guard with Diretide on an active minion to get an immediate big frenzy hit. Bellow acts as a backup Diretide, pushing greater immediate damage but only temporarily dealing with surrounding minions. Greater Fortitude is just a pure pump spell, which critically also boosts toughness to enhance survivability. If you play your cards right, your opponent will left with the “Makantor dilemma”: needing to rebuild their board, but also needing to deal with a large minion which threatens to wipe them again if not answered. Flash Reincarnation lets you cheat on mana costs, which is useful at all points in the game: early it lets you drop a quick Slasher or Warbeast to better control the board, and late it allows you play a rush minion together with multiple buffs to close out the game. Natural Selection is the Magmar staple removal spell, and does its job well here since your minions are relatively large and can be buffed higher as needed. Lower on the curve (mana cost ≤3), all of the minions are well-statted and each offers some form of additional upside. The really important minion in this category is Wings of Paradise. Out of all these minions, it has the weakest base stats relative to its cost, and moreover is a removal magnet for any competent opponent. However, it synergizes extremely well with the buff spells, and keeping one alive for a turn enables the most busted plays the deck can make. Try your best to position it carefully to maximize its odds of survival. 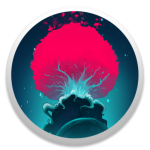 As a backup plan, the extra stickiness of the Rebirth minions often allows them to live long enough to stick a buff; however, it is much more difficult to get these into optimal position. The curve toppers (mana cost ≥4) all have “Rush” (pseudo in the case of Lavaslasher). Elucidator is big and fast, and is the easiest way to get immediate value from your pump spells. Lavaslasher’s large toughness also helps it survive long enough to be pumped. The Warbeast usually doesn’t need buffs to do its job, but late in the game you can stack some on it for game-ending out-of-hand burst. There’s not too much that can be done to upgrade this list while keeping to the same overall gameplan. Kujata might be better overall than Flash here, as it has a persistent effect and can be buffed itself in an emergency. Homeostatic Rebuke is another removal option that has good synergy with Frenzy. The original Flyhorn decks would also run Young Flamewing, which I’m not a fan of personally due to its relatively high cost and lack of any immediate effect, but is the best option if you do want another flying minion.